Research from the Stockholm Resilience Centre shows that we have already exceeded the planetary boundary - one of nine - for the loss of genetic diversity. Agricultural biodiversity is the basis for the resilience and adaptability of agricultural production systems; supports important ecological functions; and provides direct health and nutrition benefits. Q: Why are small-scale farmers and agricultural diversity critical communities and resources for healthy people and a healthy planet? SHB: According to the Food and Agriculture Organization, agricultural biodiversity includes the components of biological diversity that are essential for feeding human populations and improving the quality of life. It includes the variety and variability of ecosystems, animals, plants and micro- organisms, at the genetic, species and ecosystem levels, which are necessary to sustain human life as well as the key functions of ecosystems. Agricultural diversity at the genetic level is the “genetic toolkit” that enables us to respond to climate change and other biotic and abiotic stressors. It is the raw material for evolution. We may look out at hectares and hectares of wheat fields or rice paddies and feel confident in our food and nutrition security. But without diversity, a species has lost its ability to adapt and is on an irreversible road to extinction. At some point, those wheat fields or rice paddies will face a new pest or disease or a change in climate to which it cannot adapt. Imagine the Irish Potato famine without a potato to replace the Irish lumper when it was struck by blight in the mid-19th century. Today, a virus is attacking the most common banana sold on world markets and breeders are in race with the virus as they search for traits to breed for resistance. The bottom line is while food systems require more than agricultural biodiversity to be resilient and sustainable, no food system can be sustainable without it. Agricultural biodiversity is essential to humankind’s existence because without it we lose our ability to feed ourselves. 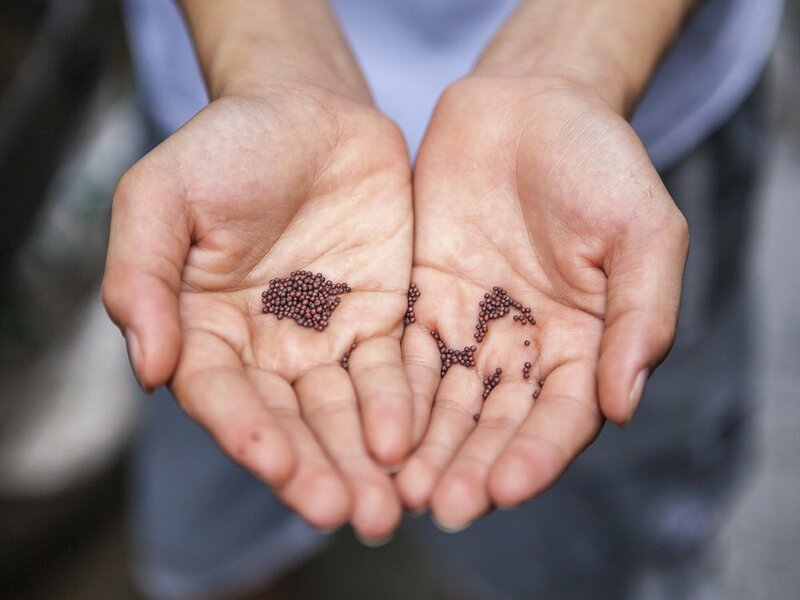 These resources are important globally in seed banks, but are even more important in fields of the world’s 1.5 billion small-scale farmers where they continue to evolve and are actively maintained and developed mostly by the world’s 1.5 billion small-scale farmers. It is not just these resources that are so important — it is this diversity combined with the role of small-scale farmers who have been conserving and developing them from the beginnings of agriculture almost 12,000 years ago that is critical. Indeed, agricultural biodiversity is not static any more than small-scale farmers are static holders of unchanging knowledge, materials or management practices. Farmers’ dynamic and collective systems of technology development and diffusion, experimentation, and knowledge and skill sharing with other farmers and with public and private entities are of immense value. Crucially, agricultural biodiversity is more than just a source of genetic traits for adaptation. It provides direct benefits for nutrition and health, it plays a part in important ecological functions like nutrient cycling, soil formation and health, water cycling and purification. It also has a critical, yet often overlooked, role in helping improve global nutrition. The world’s agricultural biodiversity base can be a source of affordable, nutritious food, if, as a global community, we understand its importance and we reflect this in our policies and action. As stated in the Global Environment Outlook 4, species extinction is occurring at 100 times the natural rate, and is expected to accelerate to between 1,000 and 10,000 times the natural rate in the coming decades. The IUCN says that the current rate of extinction may already be as high as 10,000 times the natural rate. Q: What is happening to small-scale farmers and agricultural biodiversity? SHB: The erosion of agricultural biodiversity and displacement of small-scale farmers all over the world is occurring as traditional production systems and the cultivation of diverse farmers’ varieties are replaced with more modern, industrialized production systems and the cultivation of uniform, high-yielding varieties, a trend which has been referred to the 'homogenization' of the global food supply. Today, 12 plant crops and 14 animal species provide 98% of world’s food needs. Wheat, rice and maize alone account for more than 50% of the global energy intake. Examples of the erosion of agricultural diversity include the loss of thousands of farmers’ varieties of rice in China and India since the 1960s and in Mexico more than 80% of its maize diversity. Diverse and genetically unique livestock species, those that are probably more resilient to emerging diseases, are also being lost at an alarming rate. Both within and between countries, the poor are particularly affected by the dietary simplification that results from these trends. Dietary simplification underlies the fact that for the first time in history the global burden of disease is now primarily diet-related. In our globalized world, the west is “exporting” a food system associated with obesity and poor nutrition. Obesity rates are growing faster in developing countries now than anywhere else. Tragically, one may find an obese family member and another stunted from lack of Vitamin A in a single household. Q: Is there anything I can do to help reverse these trends? SHB: If you are a consumer with the means to do so, you can influence production by choosing nutritious, fresh, local and diverse foods. Ask at your grocery store where things come from and if possible, source directly from local farmers. If you eat out, choose places that also are sourcing their food locally. Raise your and other’s awareness about the importance of agricultural biodiversity for the health of people and the health and resilience of agricultural production systems. If your city, your province, your country does not have a food policy – think about starting a movement to create one. The lens of agricultural biodiversity can serve to support more integrated policy making. Learn about your government’s policies both nationally and internationally that have an effect on agricultural biodiversity and small-scale farmers. Unfortunately, many governments are subsidizing the production of unhealthy food in unhealthy ways, with the public, particularly those already most disadvantaged, paying the highest price in terms of environmental damage and damage to their health. A lot of money supports a system that feeds only 30% of the world’s population. With political will, the money is there, it just needs to be shifted to support more sustainable, healthier practices. Governments can make the difference by creating food and agricultural policies that promote and integrate agrobiodiversity as an essential tool for health, nutrition, for ecosystem services, rural livelihoods, resilience and the sustainability of food systems overall. Look critically at any policy that results in the erosion of agricultural biodiversity on-farm or the displacement of small-scale farmers. Knowing agricultural biodiversity is a precious resource necessary for humanity’s survival, ask: is this approach really the best way to achieve the stated objectives of the proposed policy? The good news is our modern agricultural system is young in relation to humankind’s 12,000-year history with agriculture. It emerged after World War II and reflects a particular political and cultural context. Both of these can be changed, and it is an opportune time to do so. This is because, while experienced unevenly, hunger, malnutrition and obesity touch all parts of the world in a way they have not in the past. It is an opportunity to build alliances across and within countries, to increase understanding and relationships between consumers and producers and ensure our policies and actions support small-scale farmers and agricultural biodiversity as the foundation for sustainable food systems. Copyright © 2018 Seeds for All - All Rights Reserved.